"Written by three members of OMG's MDA standardization committee, MDA Explained gives readers an inside look at the advantages of MDA and how they can be realized. This book begins with practical examples that illustrate the application of different types of models. It then shifts to a discussion at the meta-level, where developers will gain the knowledge necessary to define MDA tools." 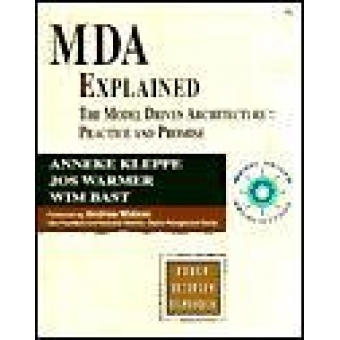 Highlights of this book include: the MDA framework, including the Platform Independent Model (PIM) and Platform Special Model (PSM); OMG standards and the use of UML; MDA and Agile, Extreme Programming, and Rational Unified Process (RUP) development; how to apply MDA, including PIM-to-PSM and PSM-to-code transformations for Relational, Enterprise JavaBean (EJB), and Web models; transformations, including controlling and tuning, traceability, incremental consistency, and their implications; metamodeling; and relationships between different standards, including Meta Object Facility (MOF), UML, and Object Constraint Language (OCL).